The traditional, nubby oxford fabric we developed last year has proved so popular that we’ve decided to introduce another option. It’s a little unusual in another way though, beyond the robust, textured yarn. It’s an off-white and blue stripe, rather than blue and white. The difference is very subtle. Few people would notice without it being pointed out. But using this warm, creamy colour rather than a cold white does have a real effect. A shirt made up in the fabric looks more casual, perhaps a little vintage: rather like using yellowed mother-of-pearl for the buttons on the ready-made shirts. Most brands offer blue/white stripes because they are smarter and more corporate. Nothing wrong with that. But this PS Oxford shirting is not meant to be formal or corporate. It’s supposed to be more traditional, rugged and robust - a better match for jeans and tweed than a sharp suit. And as ever with the products on Permanent Style, it’s nice to do something a little different. Something that you can’t find from a dozen other brands, and fills a gap in the bespoke market. 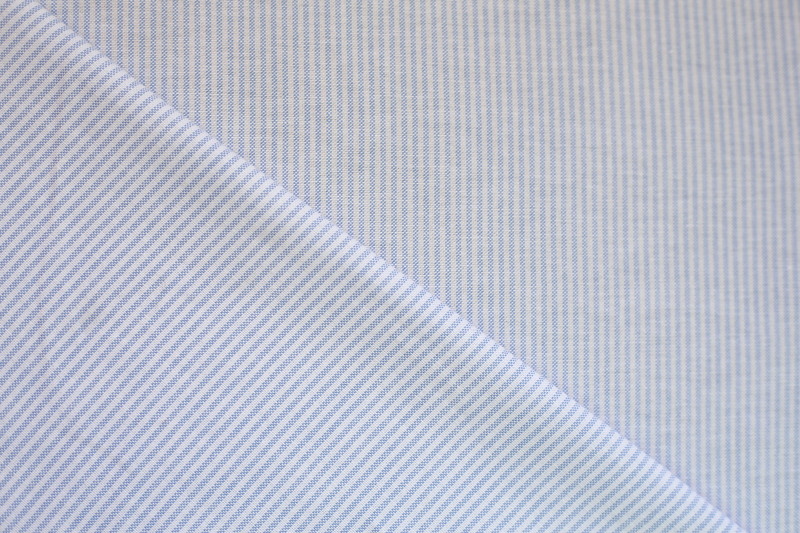 This blue/cream stripe uses the same yarn as the popular PS Oxford cloth introduced last year. So it has a relatively thick yarn in the weft (1/10) but a finer one in the warp (2/90). The thicker weft makes it tougher, and wear in beautifully - like the vintage oxfords that inspired it - but the finer warp retains a touch of luxury. Oxfords with anything near that thickness aren’t available as cut lengths for bespoke customers, which sets the cloth clearly apart. But even RTW shirts rarely use single-ply yarn in the weft. 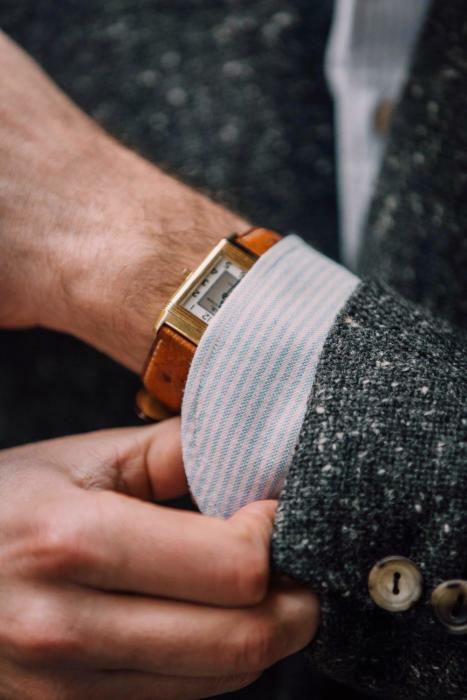 The result is a shirting that reproduces the look and feel of oxford shirts sold by Brooks Brothers and others in the 1950s and 1960s, including the nubby surface that comes from the varied thickness of the short-staple cotton. You can read more about the development of the fabric, and the research with Italian mill Canclini, in the first post on the plain-blue oxford cloth here. Since I’ve had this blue/cream stripe, I’ve found that it also works with a serge trouser and structured donegal, as pictured. This is very useful. It means I can chuck on the shirt with jeans at the weekend, but also wear it with sports jackets. And given I rarely wear worsted suits these days, it also makes it perfect for travel. When I went to Milano Unica this week, I travelled in this striped-oxford shirt and had a plain blue in my bag. I wore jeans and a sweater on the plane, changed into flannels and a tie for dinner, and wore the plain blue the next day open-necked with a jacket. There will be ready-made shirts in this cloth available later in the year, made up by Luca Avitabile. For now, the cloth is available in the normal 2m lengths, to have made up by a shirtmaker. If you want it sent directly to a maker, please put them down as the delivery address, including your own name as a reference. Then drop them a note so they know to expect it. 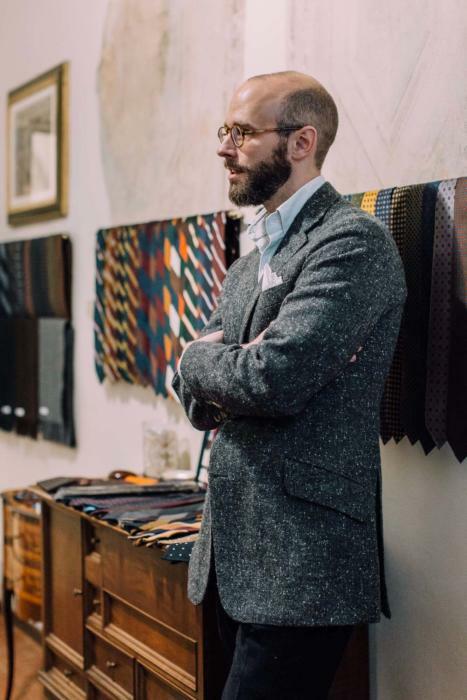 Full information on the PS Oxford cloth and its journey here. Below, a comparison of the cloth (top) to a normal blue/white stripe (below). You can follow the discussion on Introducing: Striped PS Oxford cloth by entering your email address in the box below. You will then receive an email every time a new comment is added. These will also contain a link to a page where you can stop the alerts, and remove all of your related data from the site. V Smart. How much will the shirts be once Luca has made up? This may be a rather ignorant question, but when this is listed as 250g/metre, is that the same unit as one would find on suiting (usually written as g/m2 or gsm, eg. 330g/m2)? Is not too heavy? 250 is nearly 10oz. It is nearly suit material. I had an overshirt made on 8oz denim as it was too thick for a shirt. No, it feels like a regular shirt. Certainly heavier than a fine dress shirt, but no different in weight to other oxfords you see from ready-to-wear brands. Are you able to say if there are any plans for a more summer weight PS cloth this year? Either a linen/linen mix or a lightweight cotton? I feel the PS Oxford/Everyday Denim may be a little much for July/August on the continent (or perhaps even in the UK at times). There are no plans for a cloth of that type, no, though we will be doing a lightweight Friday Polo again. As with all our collaborations, the aim is to fill gaps I see in the market, rather than offer a full range. And I like the linens and cotton/linens already out there! I believe this weight might be per linear metre, which would make the per square metre weight less. Otherwise, it does seem like it would be fairly heavy for shirting. It doesn’t necessarily make a difference though, as it will be the same as other shirts (which are often around 200); and whether it’s the same area comparison as a suit will depend on which mill it’s comparing to. My guess is the grams per square metre weight is probably around 165g. This can be compared, for example, to the 145-150g per square metre of Thomas Mason Oxford 75. I will probably order one. Do you have any plan for a “hard Brexit” Simon. I guess that most of your collaborations are made in Italy and it would be easier for people living in the EU to have them sent directly. And cheaper if it would be some kind of tariffs. It would also be interesting to have an article about how UK based stores with a lot of EU customers will handle a hard Brexit. Didn’t need much convincing one I saw the pictures . On a more general point around shirts , being someone whose budget normally only extends to RTW , what in RTW would you recommend for ply , warp , weft ? For business and casual shirts . I’d focus more on the weave than the ply, to be honest. Maybe have a look at the shirt guide pieces for guidance there? Finally! 🙂 I’ve been waiting for this to come, I really enjoy the feel of the first PS Oxford cloth a lot and this looks great as well. If you have any particular feedback on what you liked, do share it with everyone. People can only take so much of me talking about it I’m sure! Shirt and coat look good, really good, but thought you were not a fan of blue odd trousers? Aha! Very good spot. Yes, I still am not in general, but there are a few small ways in which I do wear them, and only when the trousers are in particular cloths. I’m going to do a post on that soon. What I really like with the shirt I had made in the first PS Oxford cloth is the wonderful coarse texture, you can really see the white and blue threads in there but it’s still really soft and comfortable. The weight of the fabric is also very nice, definitely more substantial than my “normal” shirts which makes it drape really well (if you can say that about a shirt) but it’s still not too thick so it gets warm or anything like that. And it’s really easy to iron. Since I hardly ever wear a suit in my work the casual OCBD I had made in this cloth by LA gets used a lot with chinos and jeans (to the point where I was thinking about ordering a second identical shirt, but now I got the striped version instead!). Now I’m looking forward to a pink version of the original Oxford cloth, I think that would be great as well! Simon, the jacket in the pictures looks beautiful. I’m surprised at just how soft the shoulders look. I just ordered an oatmeal linen jacket from Steven as well and I have a couple of suits on the way. Looking forward to receiving them and hoping for a similar result! (I also ordered a length of the new oxford shirting to be made up by Luca). I bought the first shirt in the first version of the cloth as RTW (the shirtings were out of stock) and has since then made a bespoke version of it and ordered this cloth as a second bespoke shirt. I think it is lovely. Works perfect with jeans and flannel trousers. I often uses it with a halflined harris tweed sport coat. The tweed is too stingy for delicate shirts so this is perfect. Is it just me or does this have a distinctly pink “sheen” in the pictures? Presumably just a trick of the light, just wondering if anyone else is getting this? Perhaps edited a little red rather than green. Certainly no pink cast in the cloth, don’t worry. 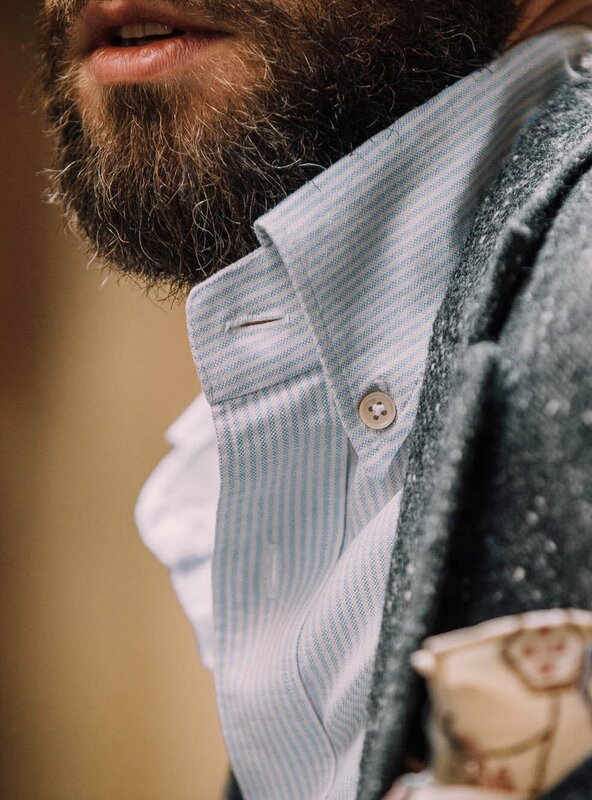 I love my mercer button down shirts but would like bespoke, spread collar shirts in similar fabric… would you recommend the PS oxford to that end? Congratulations on another development! The cut looks very fine though in future offerings could we see an image sans jacket – especially to get an idea of the well designed collar shape? For a white casual shirt, what fabric would you recommend? Oxford is certainly an option, but I feel the really beauty of oxfords are the interweaving different colours and the resulting mixed white and coloured effect. White end on end is a great fabric for a casual shirt. It doesn’t of course look like a coloured one, but it has a degree of texture which is nice. Any idea when ready to wear shirts in this fabric will be available. I love my Oxford and am kkicking myself for not buying a few when I had the opportunity. Also any plans for a plain white Oxford? It will be a few months I’m afraid – generally we release the cloth first, then weave some more to do both cloth and shirts. However, we did release new denim shirts in both shades today, and plain oxford shirts should only be another month or so. 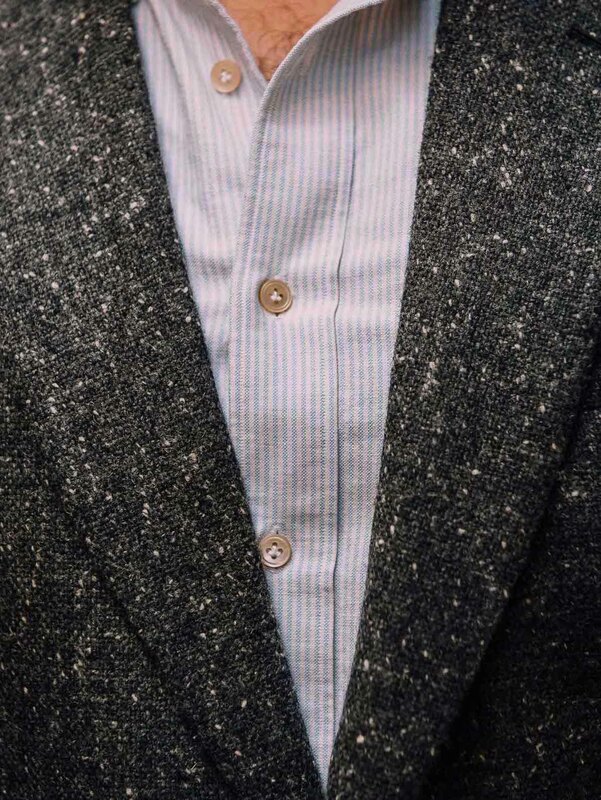 Hi Simon, what do you think of a hidden button down collar for more casual fabrics such as this (particularly if worn without a tie)? Does it make sense or is a visible button preferable because it’s more casual? Just received my everyday denim shirt and am simply blown away by the fit and quality. So much so that I’m now keen on purchasing one of your Oxfords. Any idea on when you will be restocking in sizes? I’m looking for a large. Also the blue/white stripe Oxford. Will and if so, when will you selling these? Thanks Richard, that’s so nice to hear.